Anastasia Ardosheva ’17, an international student from Moscow, Russia, looks through a microscope at blood samples at a hematology lab in Yale University's School of Medicine. An Internship is a structured learning situation where concepts learned in the classroom are applied to the realities of an on-the-job experience related to the student's P.O.E. and career goals. 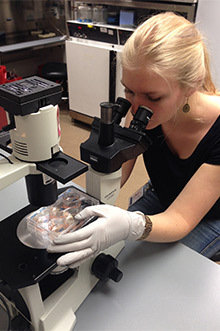 Internship experiences facilitate student entry into their chosen profession and can provide them with experience in state-of-the-art facilities, training on specialized equipment, income to help offset educational expenses, academic credit applied toward a degree program, and a professional network. In addition, the college gains valuable feedback from employers on instruction, curricula, and programs. Juniata offers Super Internships, stipends of up to $5000 to students participating in internship experiences in areas where living costs can be prohibitive. The primary purpose of an internship is to provide an educationally sound platform for the development of the student's human, social, and management skills through a field-based activity. Interns receive practical training and experience in a variety of settings through cooperatively arranged placements. Interns are employed in pre-professional, not menial, positions and work side-by-side with permanent employees. "The Career Development office has helped me to refine my resume, build cover letters, search for companies that interest me, and most importantly, secure interviews with top companies. They have given me the opportunity to succeed in the future, and I look forward to my Corporate Finance internship with UPMC for the summer of 2012." In a competitive job market, career related work experience can be the key to obtaining full-time employment following graduation. Many employers use internships as a means of identifying potential employees and "trying" them out before committing to full-time hire. A career-related internship experience can give you the edge in the employment marketplace. Each year 225+ Juniata students participate in substantive, career related internship experiences. The keys to their success are getting an early start and preparing. The following are a few guidelines outlining steps in the process. Must you earn money or can you volunteer? Are there specific things you must have included as part of the experience or is general exposure okay? Can you live anywhere or is a specific location necessary? Know what you bring to a potential internship employer: interests, skills, personal characteristics. Develop a resume (attend a Career Services workshop) to effectively market and distinguish yourself from other candidates. Understand how your qualifications fit with a particular employer and prepare to sell them on how you can assist in solving their problems. The Career Services Office has a variety of resources available to assist you in identifying potential internship employers. Potential resources include employer/internship directories, internet databases, faculty, alumni contacts and places with ongoing relationships with Juniata College. Don't forget your personal network of contacts. It is always better to be too early than too late. Many of the best formulated internship experiences have early application deadlines. Some as early as January for summer internship experiences. Typically it is appropriate to contact a human resources department (or other appropriate individual) 3-4 months in advance. Call or write to request information and ascertain application procedure. Neatly complete (type) any application forms/materials. Ensure that your file is complete. Should you be offered an interview, be prepared. Consider attending an interview workshop offered by the Career Services Office. Always send a thank you letter indicating your appreciation and interest. If you were not granted an interview, follow-up as well to distinguish yourself from other candidates for the next round of internship hires. Credit for internships is not given for work per se. Students apply theoretical concepts to the workplace and reassess ideas. Hence, academic credit is given for placing the pre-professional work experience in a conceptual and comparative context. The primary distinction between credit and non-credit internships is the degree to which students are required to reflect on their experience. This distinction is exhibited in the differences in the academic requirements, the degree of college supervision, the investment of college resources, and the student's payment for and receipt of credit. With both credit and non-credit internships, placement is a coordinated responsibility of the student, internship staff, and faculty members. For credit internships, the academic department is expected to lead the effort, while in non-credit internships, the internship staff takes the lead. In the case of credit internships students may be compensated for internship work as long as the department and/or faculty sponsor believes that the college can maintain enough control of the internship experience to ensure its academic validity. Interns working in non-credit situations are normally, but not always, compensated. A student pursuing a credit internship must be of junior or senior status, have a 2.0 cumulative grade point average, and be in good academic standing. Individual departments may set additional requirements including a higher GPA standard. Obtain forms from the Office of Career Services - Intern Registration Card and Learning Agreement Plan. Complete and present for approval signatures the internship "learning agreement plan" to appropriate faculty (faculty sponsor, both advisors, and the department chair) for review. Upon approval, students submit the "plan" to the Director of Career Services and the Registrar for final acceptance and signatures. Agency contracts are developed as needed. Students must register for an internship and an internship seminar (Note: Students generally follow the registration dates and deadlines of the college, however, some flexibility exists as "employment" can begin at times that don't coincide with the Juniata semester). The Faculty Sponsor determines the amount of credit to be awarded, which in turn determines the intensity of the experience. A semester internship carries a minimum of 4 credit hours (2 internship hours + 2 seminar hours) and a maximum of 15 credit hours (normally 9 + 6, except in cases where an outside accrediting agency requires otherwise, such as Social Work and Education). Students can earn no more that 15 internship credits during their four years at Juniata, including a maximum of 6 hours in summer internship credits (unless more summer credits are necessary for certification in a particular area). The faculty sponsor awards standard letter grades (A - F) for the internship and the seminar. Grading is based on the following criteria: regular supervision by the on-site supervisor; regular contact with the faculty sponsor including on-site visits as necessary; a written learning contract, where appropriate; at least one interim assessment conducted jointly by the student, the on-site supervisor, and the Juniata faculty sponsor; a final assessment conducted by all three individuals; a journal of daily activities; and, if appropriate, a portfolio of work completed. Grading for the seminar is based on contact with the faculty sponsor; an organizational profile or systems analysis; an extensive written project, paper, or program as arranged with and reviewed by the faculty sponsor. meet with sponsor, submit copies of projects, descriptive analysis of operations. journal of daily activities, abstracts, outline of final paper, final paper, share with student group. journal of daily activities, two book reviews, outline of research paper, major research paper, weekly meetings with sponsor. journal of daily activities, weekly sponsor meetings, book review, two research projects. journal of daily activities, weekly meeting with sponsor, three research projects. Juniata's Summer Transcript Notation Internship Program allows a student to do an internship for transcript notation without a grade. Essentially, this amounts to a pass/fail arrangement. This benefits students by allowing them to do a comprehensive, thorough internship during the summer when it will not interfere with the normal flow of fall and spring semester courses. In addition, summer transcript notation interns are not put in the position of having to pay for extra credit hours (from an internship) that are not needed for graduation. Still, the summer internship, provided that it meets the following minimum standards, can be officially notated on the student's transcript (the equivalent of a "pass" grade). Academic Validity - The internship must consist of pre-professional, academically valid, practical work responsibilities, and may not consist solely of clerical or menial labor. Supervision - An intern should be supervised by a professional and work side-by-side with other professional employees. When appropriate, the intern should be given expert training when expected to perform certain tasks or projects (e.g., using scientific equipment). Duration - It is suggested that summer internships include approximately 240 work hours (e.g., 10 weeks at 24 hours/week). Relation to Courses - The intern must have completed a minimum of 12 credit hours in courses directly related to the internship prior to the internship. Verification - The supervisor's evaluation will serve as verification of the internship experience. Should questions or concerns arise, the Director of Career Services may evaluate the quality of the placement and/or the progress of the intern. Evaluation - The on-site supervisor agrees to complete and return a written evaluation of the intern at the end of the internship. The intern will make an oral presentation about the internship experience and its academic validity upon return to the campus in the fall. The internship committee has the authority to make decisions as to the worthiness of the internship for official transcript notation. Remuneration - Typically, though not always, summer interns are paid with the average pay range being $7.00 - $9.00/hour. While the college encourages compensation for the interns, the decision to offer pay is entirely up to the employer. Students who choose to volunteer or work for a small stipend are still subject to all above listed expectations. These standards provide the basic expectations for a summer internship. They are not exhaustive and have been formulated with some flexibility for unique situations. Upon successful completion of all requirements, a non-credit internship appears on the academic transcript as course number 001 ("Internship" followed by the title as approved by the Internship Committee) in the appropriate department. Students may complete more than one non-credit internship and receive transcript notation each time (course 002, 003, etc.). Assists students in identifying potential employers. Orientates students to the Program; provides Learning Agreement Form required to register. Acts as a general resource. Schedules and conducts job-site evaluation with employer and student for non-credit internships. Resolves problems as they arise. Discusses and assists students in determining job description/learning outcomes. Approves Learning Agreement Plan (signs off on them) and forwards them to Career Services via the students two advisors and the Department Head. Schedules job-site visits with the student and employer for the purpose of assessing progress toward completion of Learning Objectives. Determines the final grade for credit internships. Assists student in developing relevant job description. Provides work opportunities conducive to learning. Allows and participates in site visitations by Juniata College Personnel. Completes evaluation of Intern student and program as requested. Actively seek an internship position, they are not given to you. Students are expected to assume their share of responsibility for the successful operation of the program. Students on assignments represent Juniata College to their employers and influence those employers' continued cooperation with the college. Complete all applicable paperwork and related requirements. Report any changes in work assignments, supervisor name, contact information, etc. Not leave an internship assignment without the approval of the Faculty Sponsor and/or Career Services. Participate in the Student/Employer evaluation process. The student applies with the Career Services Office. A student who is currently employed in a position related to his/her academic studies may "petition" the Career Services Office and/or the Faculty Sponsor to determine if the position satisfies all internship program requirements. A student who is not currently employed in a position related to his/her academic studies with be provided with assistance in conducting a search to secure such an internship experience. The student then secures a Faculty Sponsor (Credit Internships ONLY) to oversee the internship experience. The student then completes Learning Agreement Plan by meeting with the Faculty. The student registers for internship and internship seminar credit (as appropriate). The student begins the internship work experience. The Office of Career Services or the Faculty Sponsor sends a student evaluation form. The student completes the "Student Evaluation" form. The Faculty Sponsor grades the experience. The forms are Adobe PDF files stored in a .zip archive. Save the file, double click to open the .zip file, then double click to open the PDF. Please save the file to your computer and submit as an attachment to careers@juniata.edu . Please do NOT use the "submit" button that may appear in some browsers.